After cancelling our two major trips this year, we are taking day trips around home. 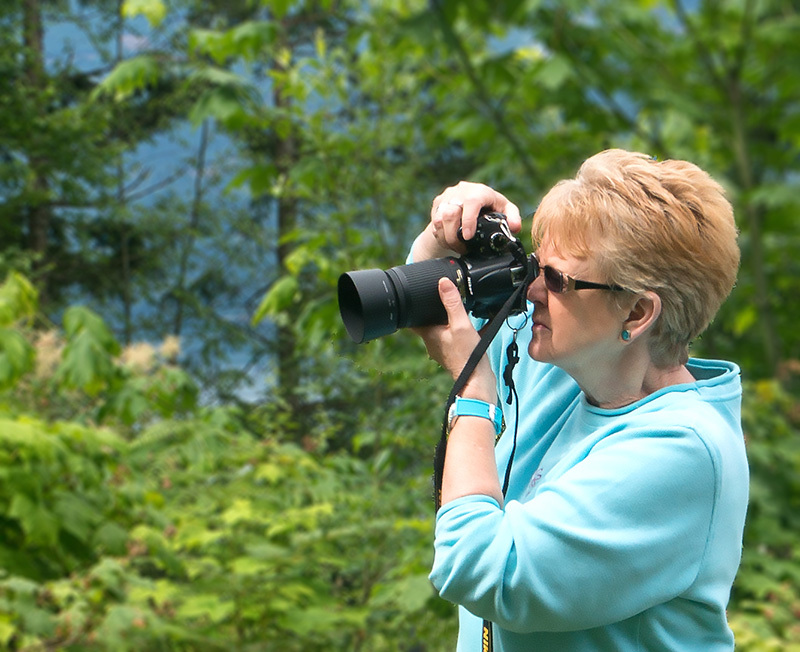 We live close to Vancouver in Port Moody and many places beg for a visit and photography. 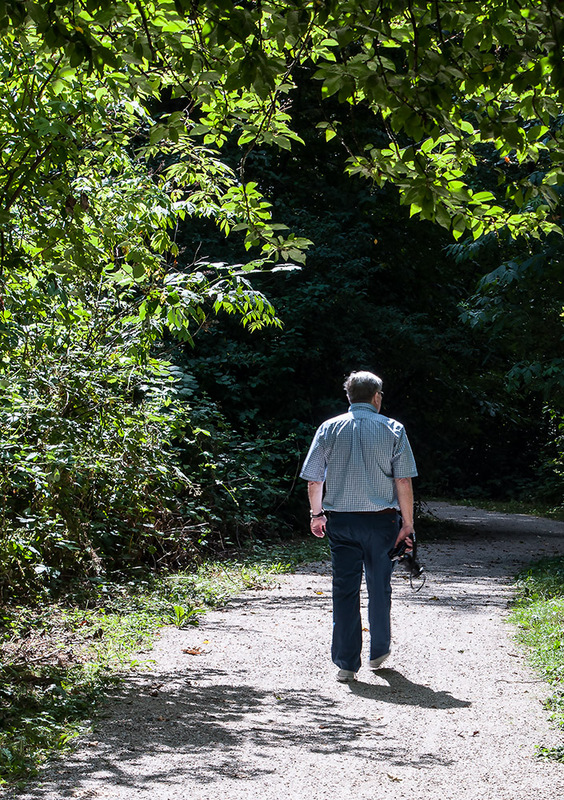 Although I've lived here for nearly fifty years, there's much left to explore. 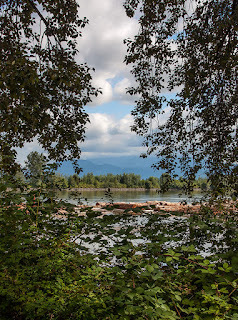 This triangular-shaped, small island was named after George Barnston, a naturalist and clerk in the fur trade who arrived here in 1827 when Fort Langley was established. Now it's a farming community with cleared land and houses scattered around, most of which belong to the Katzie First Nation on the south side of the island. 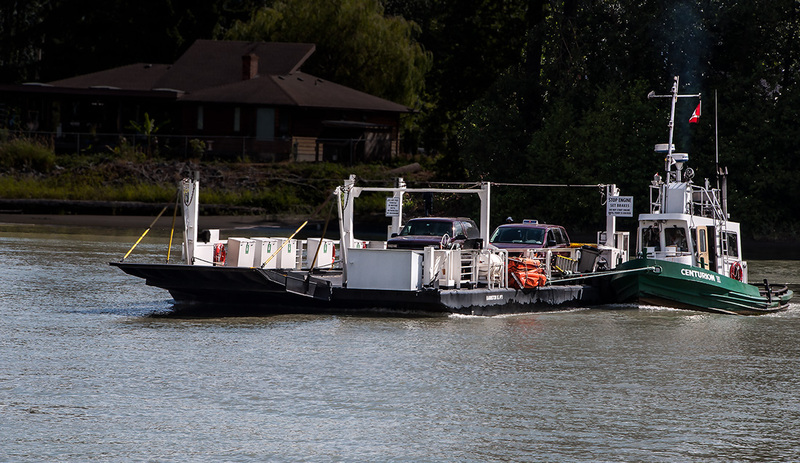 The free ferry takes vehicles and passengers across Parson's Channel on a large raft strapped onto a powerful tug. 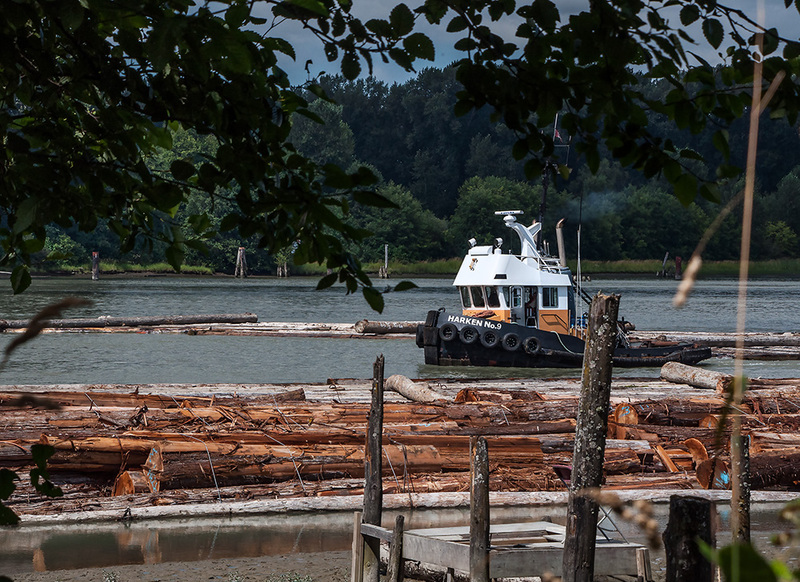 It sails across the river crabwise in the strong current and the tug's captain has to be a master ship handler to dock successfully on either side. Drivers need to know that they will have to reverse either on or off the ferry up a steep ramp. Most visitors park their vehicles on the Surrey side and walk onto the ferry with bicycles. I tackled the intimidating reversing. Traffic-free and flat, Dyke Road runs 10kms around the island close to the river and we stopped often to take photos of the magnificent views. 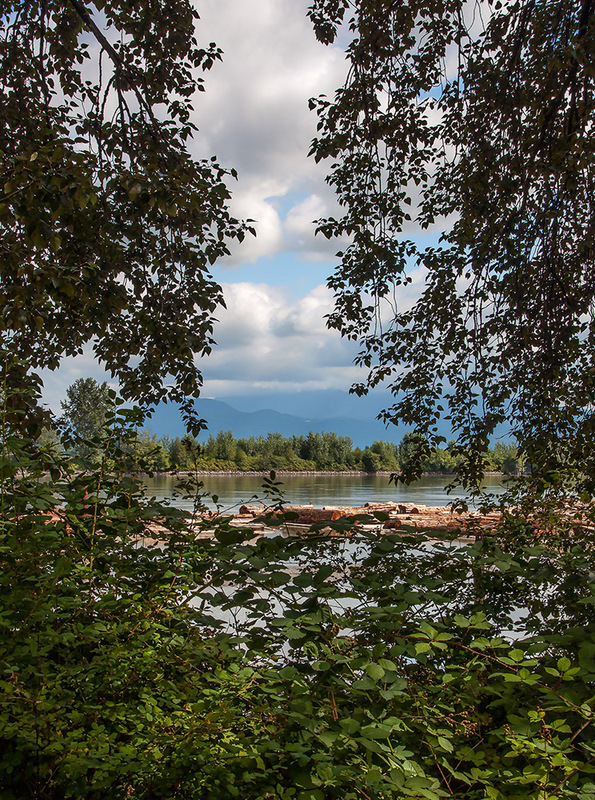 On the north side, visitors can see the entire span of the new Golden Ears Bridge with its backdrop of mountains (last photo below). 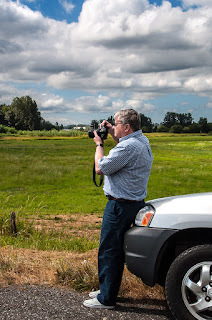 We were lucky, the cloudscapes were dramatic and enhanced the images we took. 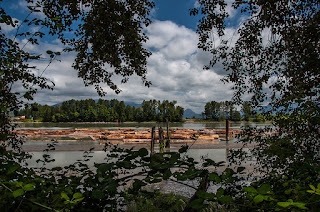 The Fraser river is a working river and there is always something to watch: log booms, tugs towing barges and booms, light aircraft taking off on the other side from Pitt Meadows airport, and pleasure craft pushing their way upstream against the current. On Barnston's northwest point is a tiny regional park with peek-a-boo views through the trees. Here too are the only public restrooms and shady picnic tables on the island. 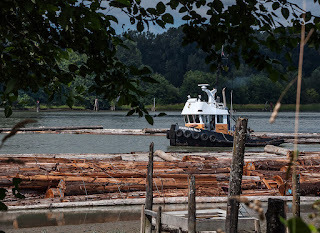 We spent an enjoyable thirty minutes watching a tug bring a huge log boom alongside others with consummate skill against the current before having our picnic and heading home.